Personally, I hate the snow. It might have been okay in December? No wait, December is full of sports wrap-ups and Christmas concerts and necessary shopping and a ton of things that we don’t want impacted by terrible driving conditions. My day job is in customer service and I can’t just not go. Luckily for me my son has recently turned 13 and can take on some of the child care duties at home, and with my youngest being 7 years old now, it’s not as dire to find child care. 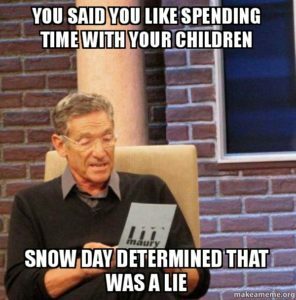 But for many, calling a snow day adds a ton of pressure on the family. If someone has to stay home, or try to find alternate child care in a hurry, on top of having to face a hideous commute – it can be really difficult to manage. We have to take care of our children. But women especially face extra pressure of not wanting to disappoint their employer or come across as ‘unreliable’, as there are often other times that we have to bail on work or try to work from home, such as when our children are sick or have specialists’ appointments. Some parents had to call in “sick”, and others made use of grandmas and the village of moms. For many they will lose a day’s pay, and many might not feel like they are in a position to call a snow day. A fellow local mom & employment lawyer, Sara Forte, shared her blog with me where she addresses employer rights. Basically, you are legally required to care for your child, so it would be difficult for the employer to discipline. And then there’s actually having your kids home with you. And the playing. Again, I loathe the snow. I have one child who is right there with me curled up by the fire, and a teenager who went out with his friends and had a blast (in shorts, of course). 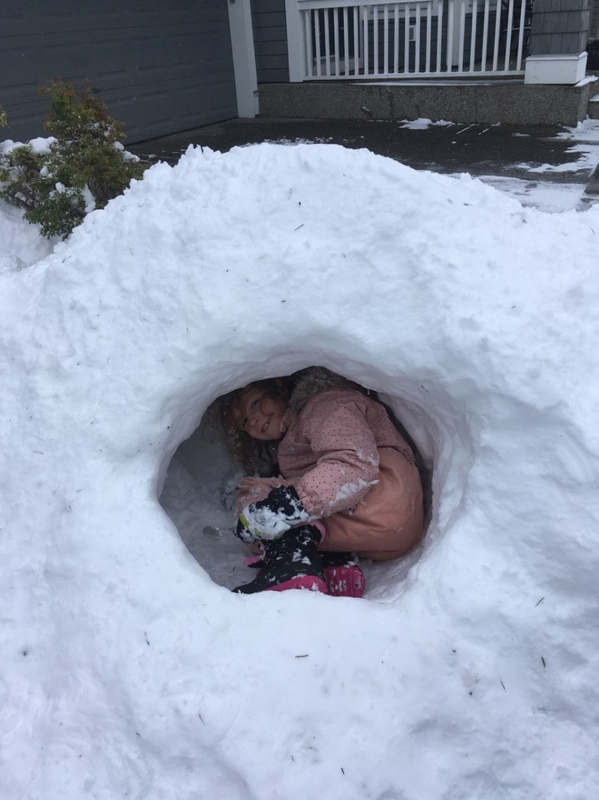 And thank goodness for a patient neighbour who helped my daughter build the igloo! I had a token snowball fight that lasted about 3 minutes before I headed back inside. So for everyone who said in December “I just want it to snow for one day”, hope you’re happy!